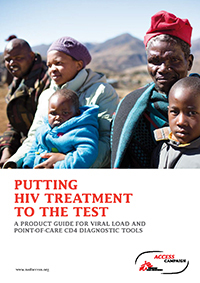 A product guide for viral load and point-of-care CD4 diagnostic tools. More than nine million people in the developing world now receive life-saving antiretroviral treatment (ART) for HIV. This represents immense progress made over the past decade—a more than 20-fold increase in the number of people on ART—but developing countries still lack access to treatment and optimised standards of care. By updated World Health Organization (WHO) eligibility standards, discussed further below, as many as 25 million people in developing countries should be on ART to reduce illness and death, and to prevent new infections. The first is the recommendation to start HIV treatment earlier, a protocol that is already routine in many developed countries. Treating the disease earlier in its progression not only improves health and longevity, but has also proven to drastically reduce the spread of the disease. The landmark HPTN 052 study showed that earlier HIV treatment helps to stave off opportunistic infections and reduces the risk of sexual transmission to HIV-negative partners by 96%. From now on, WHO guidelines recommend treatment initiation be triggered at CD4 counts of 500 cells/μL— typically before severe and irreversible damage has been done to the immune system — rather than at 350 cells/μL. Many more patients will thus be eligible for lifelong treatment, and for longer periods of time, intensifying the need for effective treatment monitoring and support. Diagnosing people before their CD4 counts drop below 500 cells/μL, and monitoring the progression of HIV in order to determine as quickly as possible whether someone needs to be put on treatment, are critical ways to improve health outcomes in resource-poor settings. The second, which is central to the focus of this report, is the recommendation for routine treatment monitoring with VL testing. Although WHO recognised the benefits of VL as early as 2003, the 2013 WHO guidelines strengthen recommendations and call for developing countries to roll-out routine virological monitoring, with VL tests at six and 12 months after treatment initiation, and then at least every 12 months thereafter. These important changes will allow adherence problems to be detected and corrected as they arise, and will facilitate early indication of when a switch to an alternative treatment regimen is necessary.